I’ve been in the mood to revisit some films I’ve enjoyed in the past, but which I have never ranked for these pages. As a result, my average score for movies has been fairly high this month (well, except for NEXT). Here is another classic, and another Hitchcock/Grant classic at that! 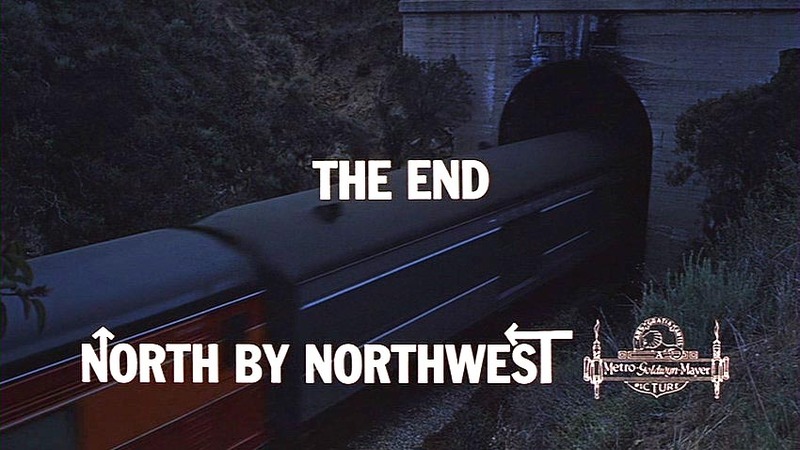 I watched NORTH BY NORTHWEST (1959) on 1.30.12. It was my second viewing of the film, and first in at least a half-dozen years. This is widely considered one of the great mysteries of cinema history, and it is always mentioned in crtics’ lists of the best Hitchock films. For me, I put it right up there with some of my Hitchock favorites, though I think it is just a fraction off of perfection. The biggest issue I have concerns the chemistry between Cary Grant and his leading lady, Eva Marie Saint. While the dialogue is there, and the acting is there, the chemistry never quite lands. Perhaps that is partly because I just watched TO CATCH A THIEF, and the chemistry in that film is just so visceral, but the relationship in NORTH BY NORTHWEST is one of its weaker points. That said, the action and building of suspense is stunning. I complained, slighlty, about Hitchcock’s direction in THIEF, noting that the proceedings are not particularly inspired. In NxN, however, he makes up for it and more. The major action pieces involve the best drunk-driving scene in cinema history, a famous encounter with a crop-dusting plane, a hilarious confrontation inside an auction house, and a climb down Mt. Rushmore. Each of those segments is vastly different, and have varying levels of action, suspense, and humor. Each is a top notch sequence. The drunk driving scene, in particular, feels equal parts dangerous and funny with a grand element of unpredicatability. The corner which Cary Grant’s Roger O. THornhill gets put into does not feel like a screenwriter’s device, but rather a situation in which he has no choice but to act out the way he does. Perhaps the character’s ego forces him to neccessarily react more aggressively than others might, but the groundwork had been laid in the first moments that this guy is a bulldog, and will do what he has to do in any situation. The use of lighting and shadow is particularly well balanced in this richly colorful film, with some of the strongest moments being the impossibly angled shadows created when Cary Grant breaks into the villain’s house at the climax of the movie. The imagery in this film is carefully calculated, and wildly successful, both of which I felt were slighlty lacking in TO CATCH A THIEF. Most importantly, for a film of this type, this is just a fun ride. I liken it a bit to THE FUGITIVE, with a charismatic leading man trying to clear his bad name while being persued by a police force which is unconcerned about guilt or innocence. 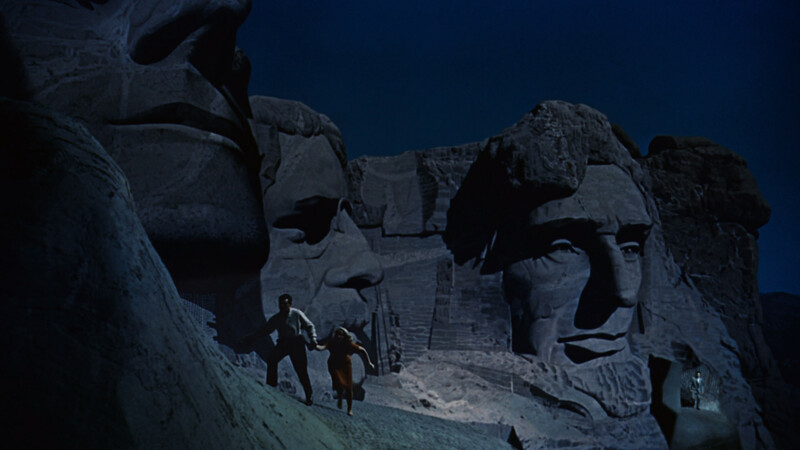 Both of these films have a true sense of danger, though NORTH BY NORTHWEST is much more playful at times. And, of course, the leading man has to find a moment to get laid. The Bernard Herrmann score is very good, if not one of his best ever. I will say though that the best musical choice in the entire film was to have nothing accompanying the plane attack. The roar of the engine signaling the plane’s distance from our fleeing hero was more than enough sound to fill the room. A dramatic score would not have been a bad choice, but utilizing no score in that moment was a better choice. NORTH BY NORTHWEST is certainly a classic. It is certainly an all-time great Hitchcock film. If the chemistry was a little more solid, I might put it in that top three of his canon. Instead, it will have to simply be satisfied being merely one of the all time greats of its genre. ~ by johnlink00 on January 31, 2012.